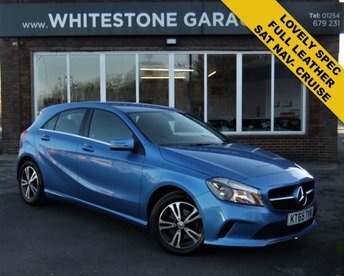 The best colour combination, this stunning A Class petrol, only costs £30 a year to tax it sits on unmarked 16 inch Alloy wheels and has a spec that includes full leather interior,cruise control, multi function steering wheel, air conditioning, bluetooth, paddle shift, satellite navigation rear camera,dynamic select,audio 20 nav, it is in beautiful condition, All of our cars are carefully chosen and come fully inspected, serviced,valeted HPI clear and with a free 12month AA membership, and are given a full years MOT prior to collection, We are well established and have been operating out of our main road showroom for over a quarter of a century so you know that if you purchase a car from us we will still be here if you need us, unlike many dealers who look good on a website but are working from a lock up or rented accommodation and will be gone if you have a problem. A vast amount of sales is repeat business and recommendations. Our customer service speaks for itself. We are here to sell you and your family and friends cars for many years to come. We do not have high pressure salesmen as we believe our cars sell themselves but all of our staff have a minimum of 30 years motor trade experience mostly with Whitestone Garage, nobody here will be trying to sell you extended warranties or get you to sign up as soon as you walk through the door, we just offer good old fashioned service in a friendly environment. Viewing is available 7 days a week at our showroom in Blackburn, Established in 1981 all of our stock is handpicked for being the most desirable spec in faultless condition with carefully researched history, We are registered with the FCA and as such are licensed to offer credit with all major finance companies allowing us to offer competitive PCP and HP deals. 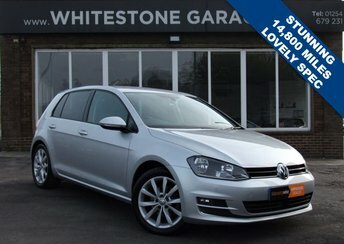 We usually carry up to 60 handpicked cars in stock all priced very competitively taking into account condition and mileage, Part exchange is welcome, We do not charge admin fees and we arrange all contact with DVLA including road tax and refunds and cherished number transfers, Up to 3 years extended warranty available on this car. If you are interested in getting an affordable finance deal on your next car, contact Whitestone Garage now! Our team works with experts in finance to help find you a fair deal based on your budget; simply use the online finance application to get started. Alternatively, if you wish to discuss which finance options are available to you, Whitestone Garage is located in Blackburn, just forty-five minutes from Lancaster. Our showroom is home to a number of second-hand vehicles in pristine condition, from practical 4x4s to refined sports cars. Whatever your needs or budget, there is no better place to discover the perfect car, at an unbeatable price. Make your way to Whitestone Garage today!